It was unfortunate when Intertops Poker and Juicy Stakes had to cancel their online satellites for the WSOPC in St Maarten when the island was destroyed by Hurricane Irma. But the good news is that they've just schedule another online satellite tournament series and this one will send the winner to Australia this winter for the AU$1,000,000 Aussie Millions! Daily satellite tournaments begin tomorrow and continue until October 8th when the champion will win an AU$3500 prize package. It includes AU$1150 buy-in for the AU$1,000,000 GTD NL Hold’em opening event on January 21st. They’ll also win four nights accommodation in Melbourne and cash for travel expenses. Online poker players can win their way to the final or buy-in at any stage. Step 1 tourneys with just a $3 buy-in are held at both online poker rooms every six hours until October 7th. Players can win their way from Step 1 to the Final or buy-in at any stage. Just before the Final on October 8th, there will be a $1 Last Chance tournament awarding one last seat at the Final Table. 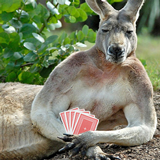 You can register for Aussie Millions Satellites under the Tournaments tab in the poker software at either poker room. You'll find further information at Intertops Poker and Juicy Stakes. Both welcome players from anywhere in the world. They’re the busiest poker rooms on the Horizon Poker Network and also offer a selection of casino games.